Desh Bhagat University among best private universities in Punjab,(NIRF Ranking, MHRD Govt. of India) appreciates the effort put by its students who have brought glory to the institution by getting selected in the prestigious beauty pageant Miss India-2017 contest. Giving details about the selected students, Pro-Chancellor Dr. Tajinder Kaur informed that the university’s 12 students of BAMS course (University College of Ayurveda) have been selected for the next round of Miss India-2017 Contest after completing major round of the pageant held recently at Hotel Holiday Inn, Panchkula. The event was organized by Khadi India, in which contestants from Himachal, Haryana and Punjab participated. Dr. Akhilesh Mishra (CEO,Khaadi Board) graced the occasion as Guest of Honour. 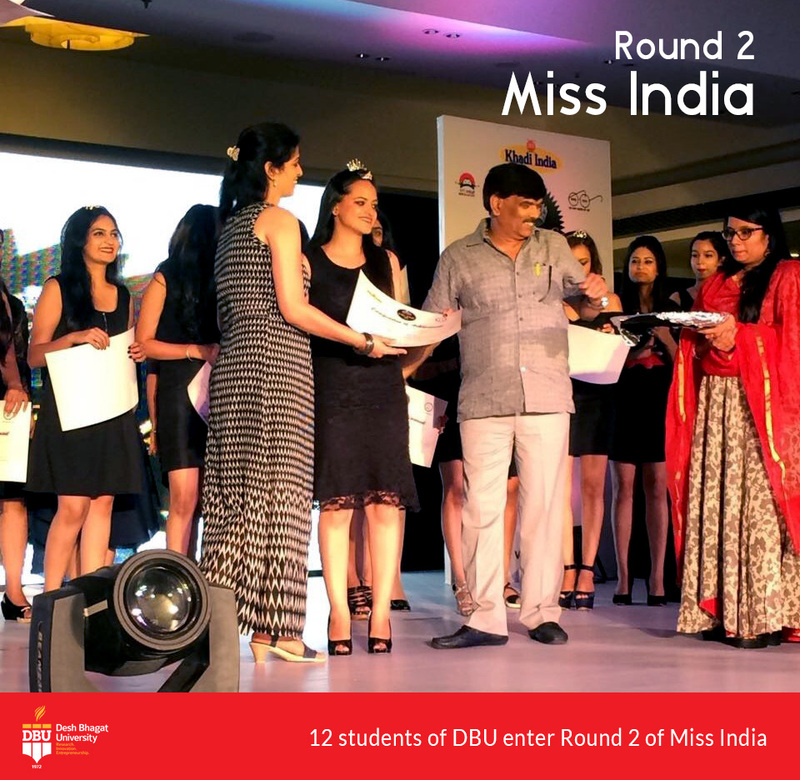 University’s 12 students won different titles, while 3 students declared first runner-up. Reema Sharma won the title of Miss India Khadi-Jammu, Shweta Sharma was declared 1st runner up of Miss India Khadi-Punjab and Miss Stylish Diva. 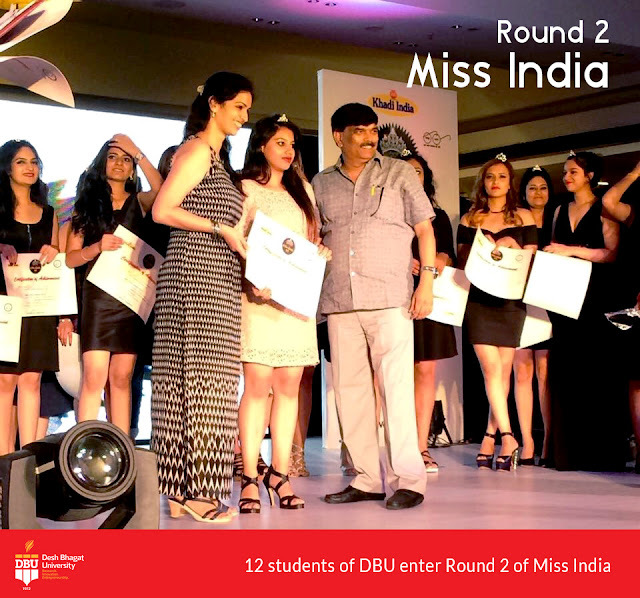 Priyanka Pulyani (1st Runner up, Miss India Khadi-Haryana), Priyanshi Singh (1st Runner up of Miss India Khadi-Jammu), Shikha Sharma (Miss Talented), Mansi Sharma (Miss Attitude), Darshika (Miss Beautiful Lips), Reena Chauhan (Miss Vivacious), Kumari Rasna (Miss Best Behaviour), Aprana Soni (Miss Beautiful eyes), Priyanka Rawat (Miss Digital Diva), Rajveer Kaur (Miss Body Beautiful) Vrishti Vishnoi (Miss Elegant) and Usha was declared Miss Descent. All the selected students were especially honoured at the campus by the university officials. While congratulating these students, Chancellor Dr. Zora Singh and Vice Chancellor Dr. Virinder Singh said that they have made DBU proud. 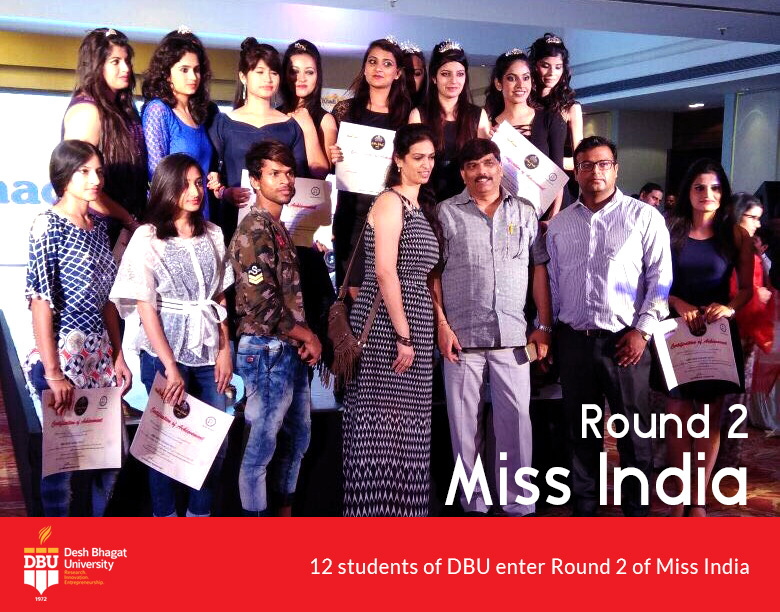 They wished them Good Luck or the upcoming Grand Finale and hoped this time our girls will bring more laurels to DBU. The students who were in a jubilant mood gave the entire credit for their success to the highly committed teachers who encouraged and guided them. 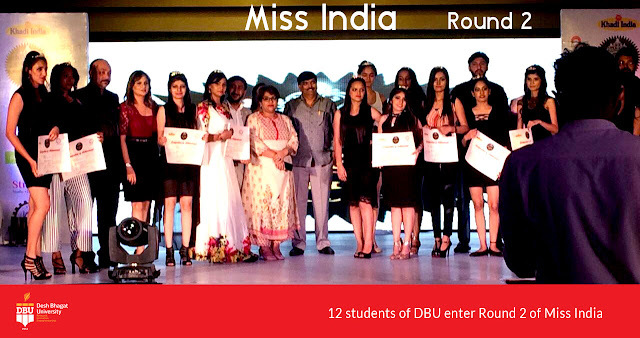 Director Dr. Kulbhushan, Director Dr. Surjit Patheja and faculty members also congratulated these students. Desh Bhagat University among best private universities in Punjab is renowned for its academic pedagogy and expert faculty. Students here find the best courses being offered in a serene and friendly environment.